Nintendo Pocket Football Club18 was first released in Japan on Game Boy Advance. I take it your intention was to recreate the excitement of a football match where you don’t want to miss a second of the action.18. Nintendo Pocket Football Club: A football management simulation game released in May 2006 in Japan on Game Boy Advance. The game allowed players to create and train up their own football team. Yes, that’s right. The players would run constantly around the whole pitch in a realistic manner... By realistic, I don’t mean that the graphics made it look like a real game. I mean that when the players shot at goal, you would think “That was so close!” just like in a real football game. The opposition would then go on the counter-attack. I was aiming to recreate the way the action swings from one team to the other with that heart-racing excitement peculiar to football. So you were trying to create a game where the action unfolds just as it does in a real football match. But you did it in a very condensed way. Yes. A football match lasts 90 minutes, and simply reproducing that wouldn’t have worked as a video game. So I made a single match last about eight minutes, upping the intensity and condensing all the action into this timeframe. How did you feel that first Nintendo Pocket Football Club game turned out? It was the first game I’d made that I hadn’t programmed myself. The programmer who worked on it was incredibly dedicated, and I felt that the action during the football matches turned out really well. It successfully captured that all-important excitement of a real football game, the thing that makes you want to keep watching. I would say so, yes. But watching the matches wasn’t the only fun part of the game. It was very important to identify which other elements relating to those matches could be incorporated into the gameplay. For instance, if I had made it along the same lines as a baseball management game, it would have turned into a simulation that was all about making money. That would have made the game into something that didn’t have a direct connection with the enjoyment of a football match. So you felt that the game shouldn’t just be about making lots of money and signing good players. Right. I did consider making it into a game where you just train up your players, but there were already games like that, and I didn’t feel that it was quite what I was aiming for. In the end, I settled on the idea of making it a game where you were given specific objectives. When you play a match, you’ll find out which aspects of individual players’ performances need improvement. You are then tasked with improving these things, and you can then train players to hone their abilities. That’s right. Then once you’ve trained up your team, it makes you really eager to get on with the next match. What made you adopt that sort of system? Well, when you play against someone else and just can’t win, it’s very frustrating, as you can appreciate. That’s why it might seem more fun to choose an opponent who’s not as good as you. But if you just choose weak opponents, the number of teams you can play against will be limited. The system used in the game means that if you take on tougher opponents, you’ll be able to achieve a lot more of your objectives. That means that even if you struggle to win, you’ll still get a lot out of those matches. That way your team will improve. Right. That was the central system we used when making the first game. 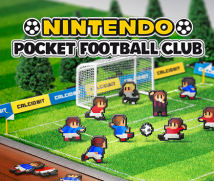 Ah, there’s something I wanted to ask... Development on the new Nintendo Pocket Football Club title began on Nintendo DS, didn’t it? Yes, that’s right. 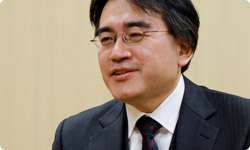 That game was released in May 2006, and Nintendo DS had already come out in Japan in late 2004. While we were working on the game, there was discussion of whether or not we should rework it and release it for Nintendo DS, but in the end we thought the priority was to get it out for Game Boy Advance. But then after releasing it, we realised it would be best to remake it for Nintendo DS. When I make games, I really take my time, and I sincerely apologise for that. During the lengthy development process for this game, as you shifted from Nintendo DS to Nintendo 3DS, what new elements did you add, and what parts of the game did you enhance? One of the new elements we added was the network connectivity. On Game Boy Advance, the only way you could create a network was by using the Link Cable. But on Nintendo 3DS, you have both StreetPass19 and SpotPass20, and this means that the range of network options available has increased dramatically.19. StreetPass: A feature that allows users who enable it to walk around with their Nintendo 3DS system turned on to exchange certain game data with other Nintendo 3DS users whom they pass on the street that also have StreetPass enabled.20. SpotPass: A feature in the Nintendo 3DS system that when activated, the system will receive various information and content from Nintendo when near a wireless internet access point. That’s right, and that’s the single aspect of the game I spent most time thinking about. I wanted to come up with the best ways to utilise this functionality and enhance the game. 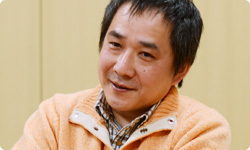 Developing the game for Nintendo 3DS meant that it wouldn’t just be computer-generated teams you’d be playing against, but also teams trained up by other players. This adds to the fun of watching games, doesn’t it? Yes, it does. Also, if you’ve already transferred the data ahead of time, there’s no need for real time connectivity between players. So you don’t have to wait for a convenient time for the other player. You can enjoy playing a match whenever you like. Exactly. In Derby Stallion, there was something called the Breeders’ Cup where you could race against horses reared by other players, and that proved to be really exciting. That’s why I was keen to do something similar with Nintendo Pocket Football Club. In addition to the fun of taking on other players’ teams, there is also the league match system to enjoy. You start by selecting the area where you live and then competing to represent your town or city. Loyalty to a team has always been a big part of football. Were you conscious of that fact? Editor’s note: In the European version, users select a European country in which to base their team. Yes, I was. Network functionality opens up all manner of possibilities, and I really like the idea of StreetPass, for instance, connecting the whole of Japan, from north to south.